Each year on April 22nd, people from around the world come together to celebrate the annual event, Earth Day, to discuss, learn, and take action on ways to protect our planet. 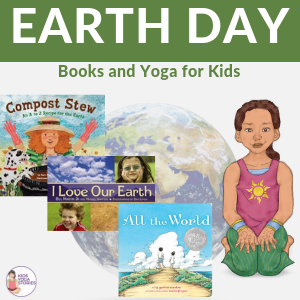 A great way to honor this special day is through reading earth-friendly books and practicing Earth Day yoga poses for kids. I Love Our Earth / Amo nuestra Tierra by Bill Martin Jr.
Get yourself ready for some yoga fun by clearing a space, kicking off your shoes and socks, and put on comfortable clothing. Use the Earth Day kids yoga sequence below as a guide or as inspiration for your own poses. The focus is on using movement to discuss different ways to celebrate our planet, not on perfectly aligned poses. Encourage your children’s creativity. Depending on their age, interest, and energy level, you could practice all fourteen poses or just a few. Begin your yoga session with a warm-up and end in Resting Pose. Don’t worry if you haven’t tried yoga before, just give it a go. Rest on your back and look at the shining Stars through the clear night sky, with no air or light pollution – Resting (Do Nothing) Pose, lay on your back imagining that you are looking at a clear night sky, breathe deeply and relax. Celebrate Earth Day through kids yoga poses! Pretend to be a book, bottle, and bicycle! Instantly download these 41 Earth Day digital yoga cards to celebrate this green living holiday in your home, classroom, or studio. Includes an Index Card, Yoga Tips, Pose Instructions, 15 Yoga Pose Cards, and 15 matching Earth Day cards. The multicultural yoga kids are from seven countries. Ages 3+. 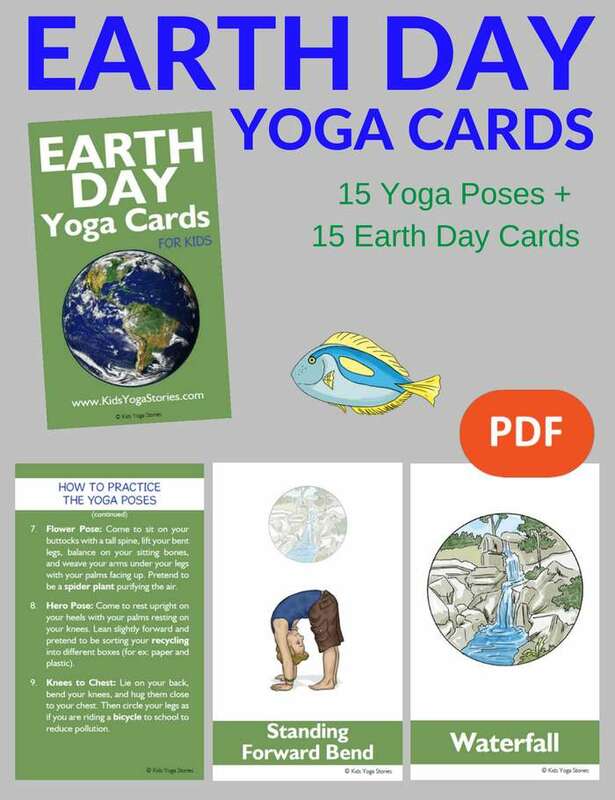 Purchase your Earth Day Yoga Cards for Kids. My daughter “swimming” like a fish in Bow Pose. Research the history of Earth Day and talk about its purpose. Create an Earth Day Scrapbook compiling all your research on earth-friendly activities. 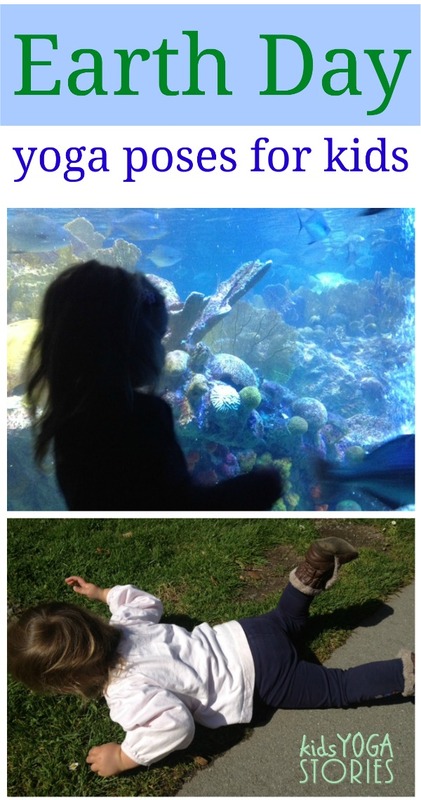 Take pictures of the children practicing the poses and make an Earth Day Book. Read books that focus on the environment, like the Magic School Bus Series, The Lorax by Dr. Seuss, or The Wump World by Bill Peet. Have the children write book reports. Share your favorites. Take a fieldtrip to a local demonstration forest, landfill, factory, recycling center, energy-efficient home, fish farm, or water facility. Take notes. 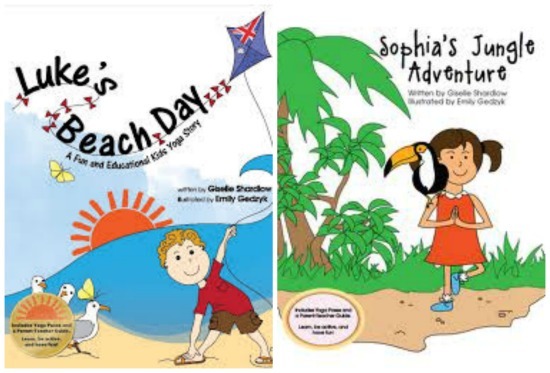 Encourage the children to share the information with friends, family, and classmates. Create a dedicated Earth Day wall for their artwork. Use recycled material for art supplies. Take magnifying glasses and a science notebook to research their observations while visiting a local park. Team up with older or younger students to do an Earth Day activity. Look at a world map and discuss environmental issues that certain areas have in common. Find pen pals from other countries who will share environmental issues from their countries and discuss ways to make a difference. Make a list of environmental challenges. Have the children choose one or two that interests them and then research the topic at the local library. Help them understand its cause, its impact, and what can be done to repair the damage. Two of our yoga books incorporate a subtle message on protecting the environment, which would be perfect for an Earth Day celebration. For more kids yoga ideas, sign up for our weekly Kids Yoga Stories newsletter by adding your name and email address in the box at the top of the page! What a unique “twist” on the celebration of Earth Day! 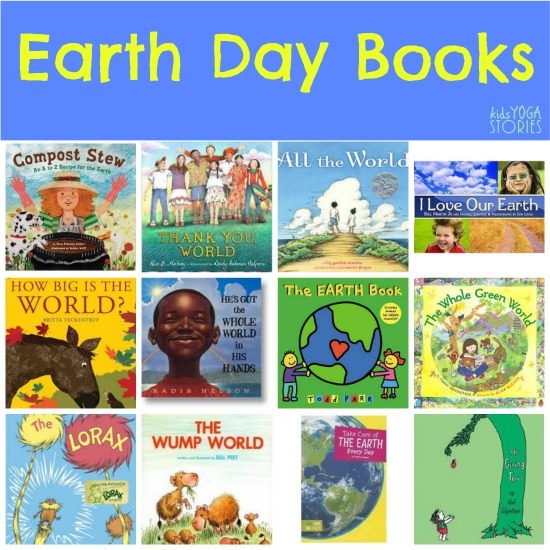 Thanks so much for including COMPOST STEW among your favorite earth-themed books, and keep up the great work encouraging kids to make every day Earth Day… with yoga! Thank you for posting this! I will definitely use the yoga sequence with my students next week! Melanie – definitely let us know how your students enjoy this Earth Day yoga sequence! Thank you so much for sharing some great ideas. Great way to honor the Happy Earth day.